1951 was the year of the Festival of Britain, the celebratory exhibition intended to help shake off the nation's mood of post-war gloom and raise its expectations of a better tomorrow. It was also the year BR raised the first of its own standards. 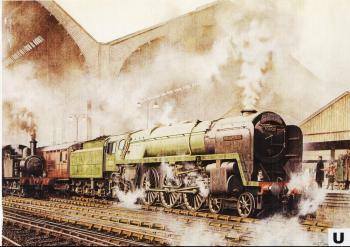 Awaiting departure from the smoke-filled cavern of Liverpool Street station is brand new Class 7P 4-6-2 No. 70000 Britannia at the head of "The Norfolkman" express for Ipswich and Norwich. Its composed modern dignity is complemented by raffish ancient impudence in the shape of the inevitable Class J69 station pilot. Britannia is the first of an eponymous class of 55 locomotives built to handle all but the heaviest expresses virtually anywhere on BR; it is also the first of the new 'Standard' engines. At nationalisation British Railways had inherited all the problems of four railways worn out by six years of unsparing effort during the Second World War. In particular many of its 20,023 steam locomotives - made up of 448 different types - were now life-expired, some having been retained "for the duration" well past their normal retiring age. A team of designers from the old Big Four companies under the former LMSR man and dedicated believer in steam, R A Riddles, was appointed to solve the problem. Their decision was to build 12 different types of standard engine to encompass almost all passenger and freight work. The new locomotives would work over all six Regions, breaking down lingering parochialism among staff, and allowing the most ancient engines to be withdrawn. Riddles had previously designed the plain 'Austerity' freight engines for the wartime Ministry of Supply. As far as possible his standard locomotives followed this straightforward, uncomplicated approach. They were essentially get-at-able engines and easy to maintain. Aesthetically they were considered a disappointment, with their running plates raised immodestly high above their wheels and more pipe work visible outside than was usual with British designs. But shed staff found the standards easier to service than many a pretty engine which had all its important working bits tucked shyly away and difficult to reach. Hindsight makes it easy to say that the standards should never have been built and that in 1948 steam was; already obsolete. With a new diesel costing 2.1/2 times the price of an equivalent power steam locomotive, no British manufacturer capable of producing large numbers of diesels quickly, ' and �no money available to buy from abroad, the options probably didn't seem so clear-cut at the time.